The 5 Stage Process Flow Diagram for PowerPoint is a horizontal funnel analysis template for outstanding sales and marketing presentations. This is a unique diagram of funnel process which displays filtering of data as colorful bubbles in flat stages. The 5 stage PowerPoint presentation also show the input and output of data analysis process. Although the direction of chevron arrow icons helps visualize the flow of PowerPoint diagram. The vector design however, demonstrates the outcome of funnel analysis. It shows the objective of 5 stage process flow diagram as the box of product. Therefore, the presenters can describe the product box image as the objective of performing activities in the funnel model. 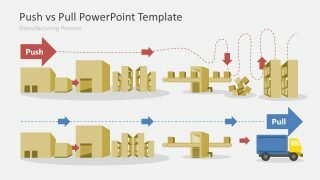 Further, this PowerPoint is also useful in presenting an activity which disrupts the smooth flow of operations. The stunning template of 5 Stage Process Flow Diagram for PowerPoint is a planning and decision-making presentation. This enables the brainstorming activity to analyze range of ideas and opportunities. Here, the team can filter out unnecessary or unfeasible options at every step according to the constrains. For example, depending on cost, time, quality or scope in addition to profitability. 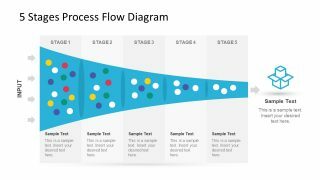 Moreover, the template of 5 stage process flow funnel can represent the effort and monitoring require in each phase to achieve a desire outcome. 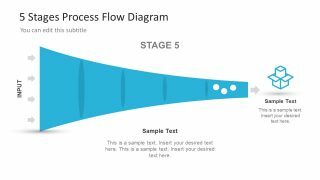 The process flow diagram template has six slides of 5 stage PowerPoint to highlight each segment individually. Additionally, each stage slide has placeholders to insert important textual content. The process flow diagram template of 5 stage PowerPoint has many useful applications. 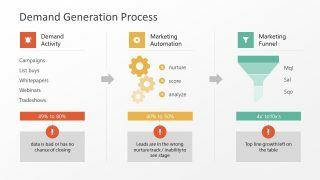 Such as, demonstrating sales, lead generation process, marketing strategies etc. Hence, the 5 stages diagram presentation of horizontal funnel produce the graphic illustration of continuous flow and product bas analysis. 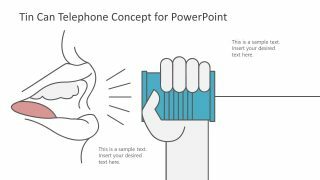 Furthermore, the editing feature of this funnel PowerPoint diagram provides users with various customization options. 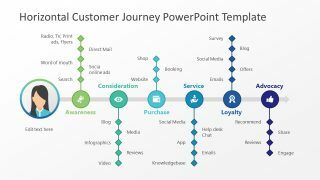 Also, check out more funnel diagram templates available in SlideModel PowerPoint collection.